Evenings are longer now, and traditionally this is the time of year when witches shake the dust from their broomsticks to take off into the skies, black cats polish their whiskers and wizards settle down with their spell books and a goblet of something tasty made from newts. Harry Potter is big business, and as well as dvds, keyrings, mugs and sticker books there are some stunning dolls made in his likeness, and those of Ron Weasley, Hermione Granger and the rest of the Hogwarts’ inhabitants. Ever since Harry first appeared – ‘The Philosopher’s Stone’, was released in 2001 – dolls have been made as tie-ins with the films, and it has been fascinating to watch these dolls develop, reflecting the growing up of the children in the films. So far, the films which have appeared are ‘Philosopher’s Stone’, ‘Chamber of Secrets’, ‘Prisoner of Azkaban’, ‘Goblet of Fire’, ‘Order of the Phoenix’ and the latest ‘Half-Blood Prince’, and as each hits the cinemas, so a new range of toys and dolls reaches the shops. Not all of the dolls are intended just for children, either! 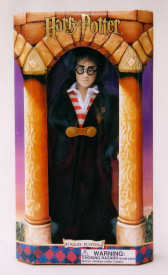 When Robert Tonner, a prestigious American designer, announced in 2005 that he intended to issue a line of Harry Potter dolls, collectors were intrigued. The first doll in the series, ‘Harry Potter at Hogwarts’ featured Harry in his school outfit of grey sweater and flannel trousers with a black robe, and was breathtaking; this was a perfect Harry! Most of the dolls in the series stand around 17 inches tall, and feature 17 points of articulation, which means they are eminently poseable. They have hand-painted faces and the modelling is excellent. 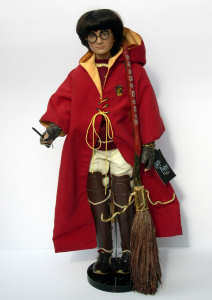 Since that initial release, other Tonner versions of Harry have appeared, such as Harry in his Quidditch outfit and Harry ready for the Yule Ball. The Quidditch Harry features him dressed in a custom knit sweater over racing trousers and shin guards. His red and yellow house robe bears the Gryffindor crest. A magnificent Firebolt broomstick is available separately. The Yule Ball version is a rather sinister Harry, in a long black robe over a formal shirt, trousers, waistcoat and bow tie. A model of Hedwig, his owl, can be purchased to add a finishing touch by perching it on Harry’s arm. The Ron and Hermione dolls are equally stunning, especially the Yule Ball versions. Ron at the Yule Ball wears his vintage tapestry robe – the subject of much mirth in the book – over a frilled formal shirt, trousers and velvet bow tie. His ginger hair is set off well by the autumnal shades of his robe. Hermione is beautiful in her long ball gown in graduated shades of purple chiffon ruffles, and with her upswept hair styled in ringlets around her face. The company also sells casual outfits which the three friends can wear for weekend outings. Now Tonner has added more characters, such as Draco Malfoy, Cho Chang, Professor Snape and Voldemort. Even Dobby, Kreacher, Crookshanks, Fawkes and the Sorting Hat are included in the Tonner creations, which means that keen collectors can act out the stories through their dolls if they want, or arrange them in scenes from the books or films on a shelf. Perhaps the most handsome of the dolls is the fair-haired Draco Malfoy, which conveys not only a sense of smouldering evil, but also of smouldering good looks. Draco has also been created as a ‘special’ in his Quidditch outfit. The delightful Cho Chang is charming in her school uniform, while the elegant Yule ball version features her in an embroidered kimono-style dress. Of course, Tonner aren’t the only company to have made Harry Potter dolls; amongst others are Gotz, Mattel, Vivid Imaginations and Gund. Gund created a series of plush dolls a few years ago, skilfully modelled with flocked-felt faces. They also produced a range of all-fabric dolls. Mattel too made soft-bodied dolls featuring Harry and his friends. 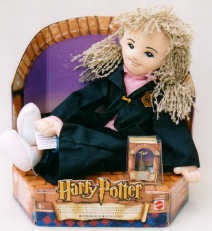 These Mattel dolls, which were some of the earliest Harry Potter commemorative dolls, were 12 inches high and featured thick yarn hair. Each doll came with an appropriate charm – Harry had an owl, Ron a dragon, whilst Hermione had a hat. Hagrid, the burly half-giant, has been made as plush toy by both Gund and Vivid Imaginations Various smaller dolls have appeared over the last decade. Mattel have been responsible for several ranges, amongst them the ‘Wizard Sweets’ series, which featured 8 inch high dolls packed in sweet shop illustrated boxes and included various sweet-themed items. They also produced moulded figures in assorted sizes, incorporating some of the characters not normally issued as dolls, such as Dumbledore and Ginny Weasley, and even a model of the Hogwarts Express, all ready to leave from platform 9¾ . Gund, too, produce unusual characters – they make an excellent ‘Fluffy’ (three headed dog), baby Norbert (dragon), Hedwig (owl) and Mrs Norris (Kneazle), all created from soft plush or fabric. They even make a golden snitch with pearly fabric wings, ready for a game of Quidditch. In 2002 the German Gotz company released a set of three excellent characters – Harry, Ron and Hermione. Each doll was 18 inches high, and the modelling was impressive. Their costumes were very detailed and excellently constructed and the character faces were slightly quirky These dolls were limited editions, but surprisingly, although they were so well-made (and expensive, around £100), they don’t sell for much on the secondary market at present. I would expect these to be ‘sleeper dolls’, which will suddenly rise in value. Character dolls, especially the top-of the range kinds, such as those featured here by Gotz and Robert Tonner, are usually a good investment for the collector.The world of entertainment is volatile, and so personalities tend to come and go. Soon, there will be no new Harry Potter films, and manufacturers will turn to different films for inspiration. Then the Harry Potter dolls, especially those which have been kept mint in box, will come into their own. Warner Brothers intend to open a Harry Potter theme Park in Orlando in 2010. 1 Harry Potter was played by Daniel Radcliffe, Ron Weasley by Rupert Grint and Hermione Granger by Emma Watson. 2 There are four houses at Hogwarts: Ravencl aw, Hufflepuff, Gryffindor and Slytherin. 3 If you wait a few months after the film’s release, the initial rush for merchandise will have slowed and shops reduce the doll prices. 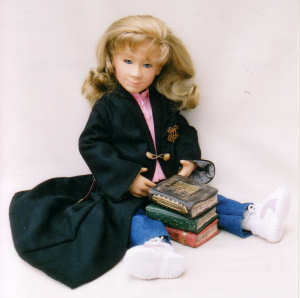 4 Harry Potter collectable dolls, such as those by Tonner, will probably have to be bought via the internet, though sometimes store such as Harrods stock them. 5 It’s easy to identify a Harry Potter doll – it will have a lightning streak on its forehead!